I first photographed Madeleine as an itty bitty newborn! You can see the images from her newborn session by clicking here. 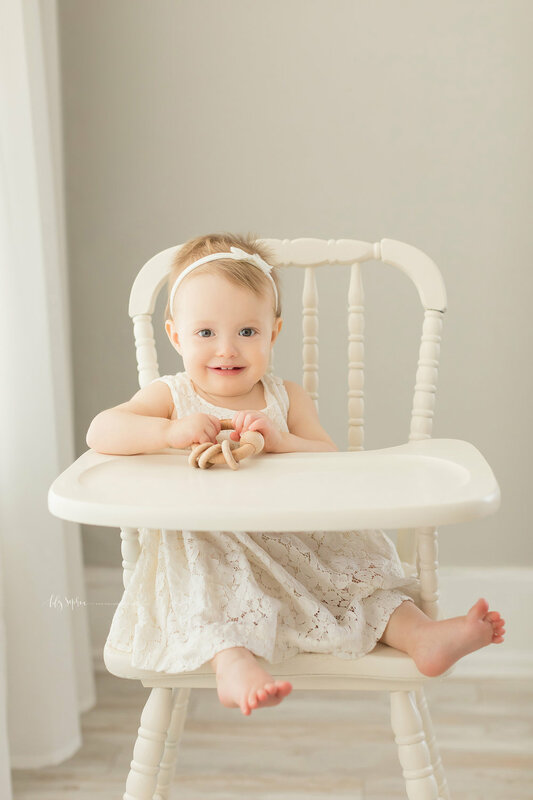 Her mom emailed and asked to schedule a First Birthday session for her, and I was thrilled to be able to see them again! I love seeing babies for milestone sessions, and seeing how much they’ve grown and changed. Madeleine definitely kept so many of her features from when she was a newborn. Her parents also opted to work with our baker for her smash cake, and chose a pretty ombre design. 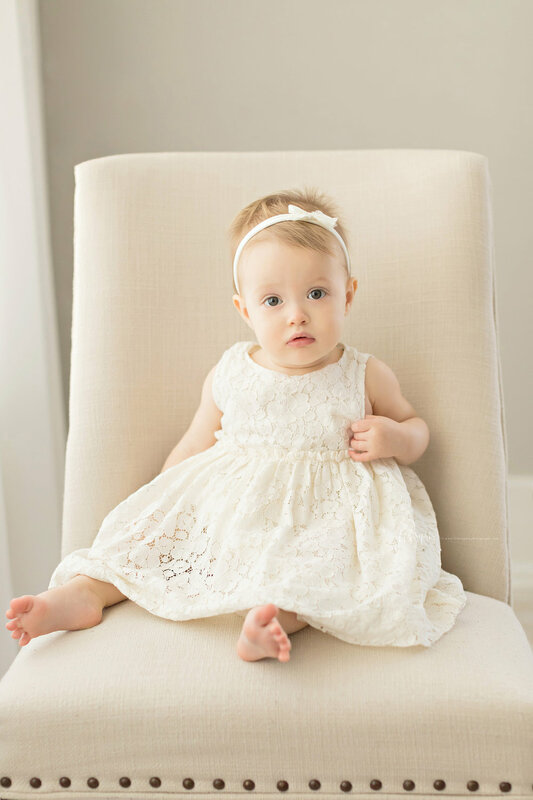 On the morning of their session, the family arrived and had brought an outfit for Madeleine, but asked to see what I had available in the wardrobe. I pulled out a sweet little lace dress and a matching bow tieback to match, and it was a perfect fit for her! It also looked absolutely lovely with her skin tone, and her parents LOVED it. We have a small selection available for babies and children as we’ve found that most mamas want to dress their babies themselves. 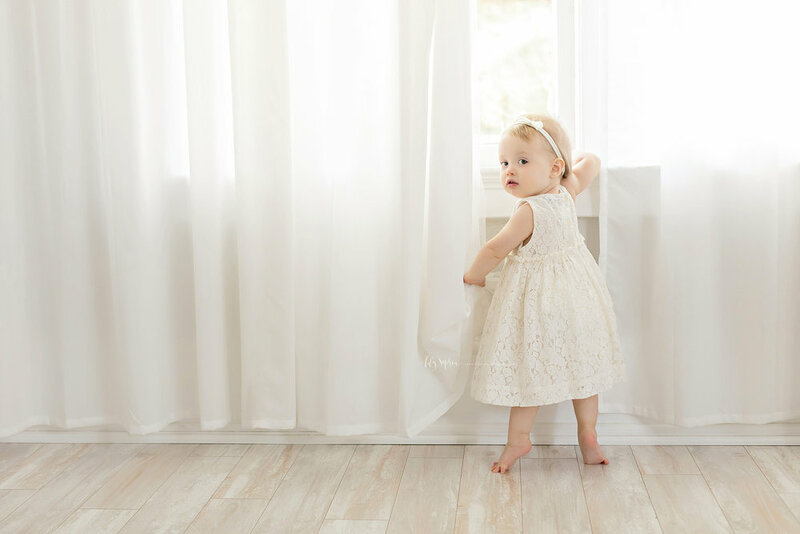 We’ll send you a helpful style guide to plan what to wear in advance of your session, and are available to look through the options you’re considering as well. 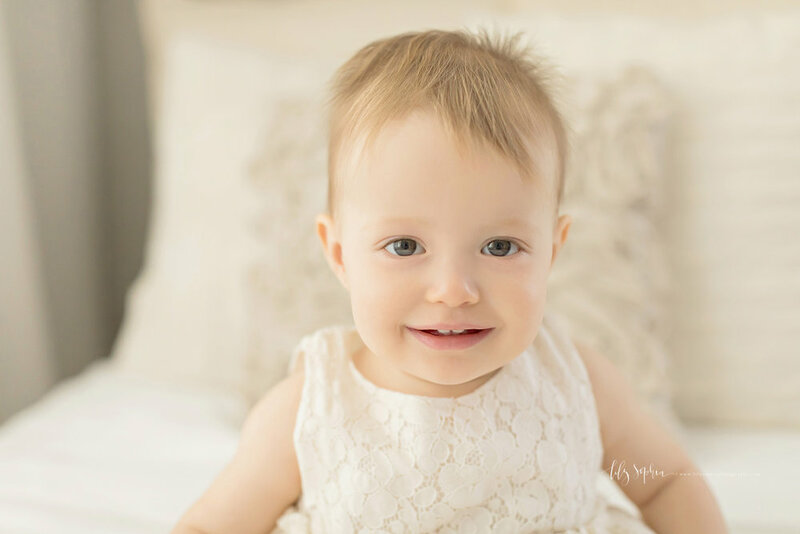 Making your portrait experience fun and stress-free is a huge priority for us! After we finished with Madeleine’s portraits, we moved to the cake smash. I pulled out one of our studio camisoles in a pretty pink color, and her mom presented her with the cake. They weren’t really sure how she would do with the cake because she wasn’t a big fan at her birthday party. 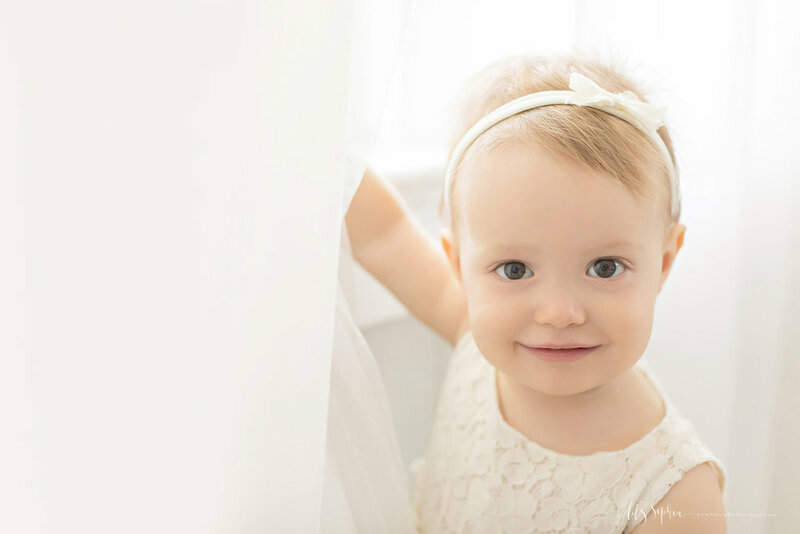 They had originally thought they would just take their own First Birthday photos at her party, but the sun was in her eyes, and the photos they took didn’t look like they had hoped. When the cake was presented to Madeleine, she immediately started exploring it and even ate some - much to the surprise (and delight!) of her parents! 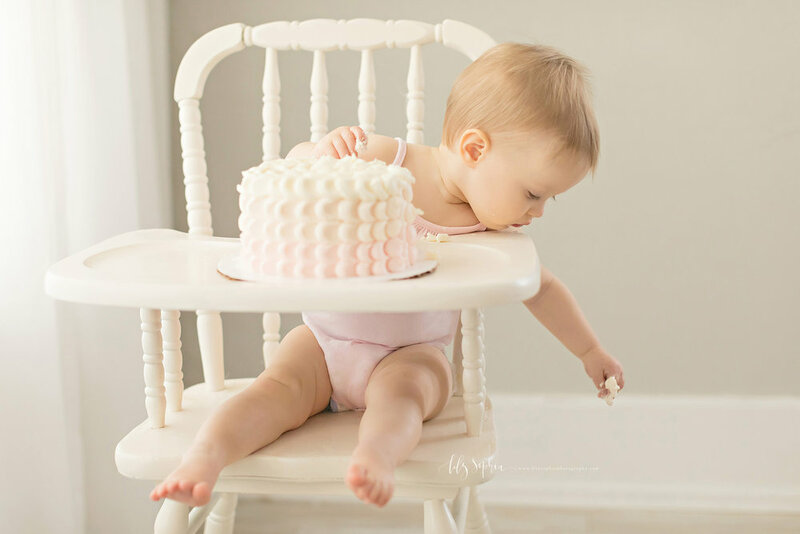 Every baby will react differently to their cake. You should know that many babies do not react well at a party, and that’s often not how they will be in my studio. 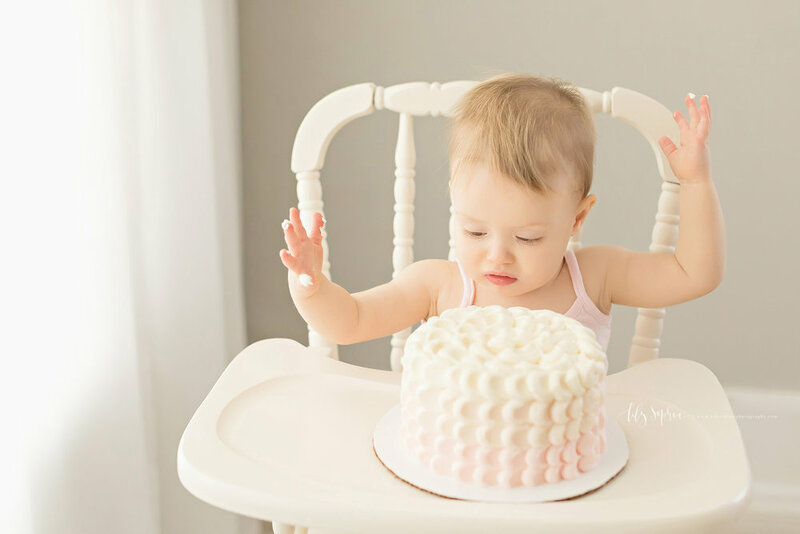 Parties are a lot of sensory overload for one year olds, and by the time the cake is served, they’re often tired and D-O-N-E. Plus, being stared at by a bunch of people can add a lot of pressure to the situation as well. 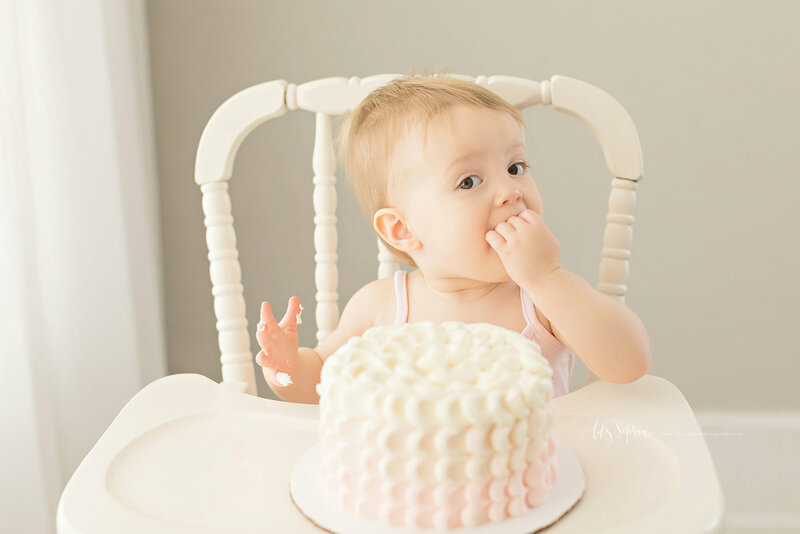 A smash cake is not a required part of First Birthday sessions, but they sure are cute and lots of fun! 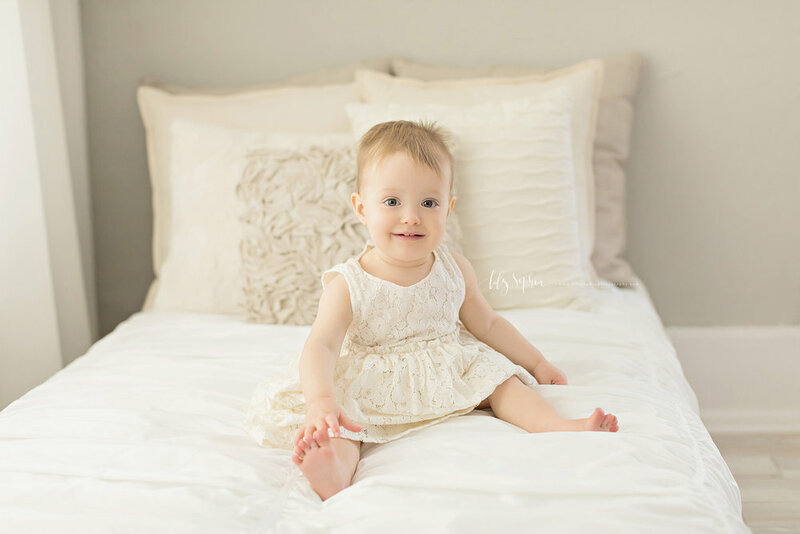 Here are a few images from this spunky little gal’s celebration in the studio!